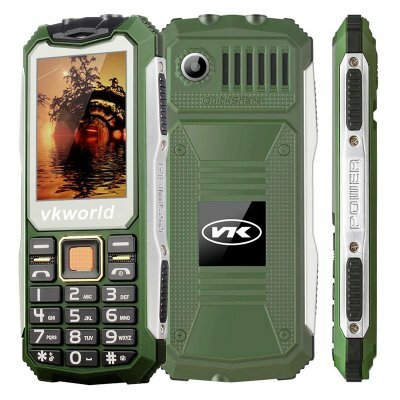 Successfully Added VKWorld Stone V3S Rugged Phone - IP54 Waterpoof + Dust Proof, Dual SIM, Quad Band, 2200MAH Battery (Green) to your Shopping Cart. The VKWorld Stone V3S is the next version of the Stone V3 and brings all the features of a cell phone with a notable difference, that being its IP65 rating. This means that the phone is tough and rugged able to withstand short exposure to water and dirt making it an ideal companion for those who work outside or in tough conditions. Complimenting the cell phones IP54 rating is a strong frame and rubberized exterior adding greater resistance to damage from drops or bumps. The V3S mobile phone does away with a touch screen and adopts the more reliable keypad. With large easy to use read and use keys you can dial numbers and type messages even while wearing gloves or with unsteady hands so there is no restrictions on usage. Two SIM card slots with quad band GSM frequencies brings global support and offers an easy way to manage both personal and business contacts. You can also use the extra SIM card capacity to avoid roaming charges when traveling making it a great second phone for holidays or outdoor adventures. With its 2.4 inch display there is more than sufficient viewing space for reading messages and seeing incoming call IDs even for those who don't have good eyesight making it a popular phone for older users. Packing a 2200mAh battery means this phone can last for up to 36 hours of content usage or remain on standby for about 1 month so it can last for several days of normal usage without needing to be recharged. with a basic set of functions its the perfect phone for those who would enjoy a simpler device without the complexities of an Android operating interface. The VKWorld V3S Stone rugged phone come with 12 months warranty, brought to you by the leader in electronic devices as well as wholesale Chinese phones..